Vengel dissects these types of conversations to illuminate how, why, and when to initiate each one. The conversations are not meant to be technical. They won’t be uncomfortable or combative. They will simply be . . . conversations. And you’ll be surprised at how quickly you see results. Your people will become better team players, take greater enjoyment in their work, tackle problems with verve, and, in the end, contribute valuable talent to your organization for the long term. Managers are facing unprecedented demands to do more with less—a trend that is clearly not going to reverse in the foreseeable future. You don’t need a Harvard Business School degree or expensive new technology to empower your workforce. All you need is the drive to make change happen. 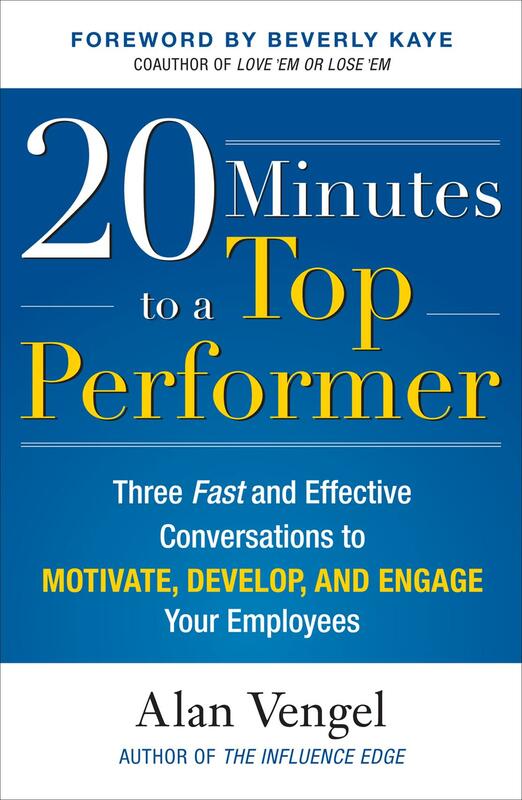 20 Minutes to a Top Performer is a blueprint to helping your people succeed. And when they succeed, you and the entire organization succeed. Ch 2: Want Some Feedback? No, Thanks! Alan Vengel is the founder of Vengel Consulting Group, a global firm that has helped hundreds of Fortune 1000 companies improve employee performance and boost overall organizational success. He is the author of The Influence Edge: How to Persuade Others to Help You Achieve Your Goals and coauthor of Sprout! Everything I Need to Know about Sales I Learned from My Garden. Vengel lives in Northern California.